Also, as of May 23, 2018, parts of the Coconino National Forest has been closed (including Kelly Canyon) because of dry conditions and the danger of wildfires. Trailhead Location: The parking area is located on FR 237, a dirt road beyond the SR 89A switchbacks. You'll need to park along the road then climb over a fence. Continue downhill. You'll be in Pumphouse Wash at the bottom of the hill. Proceed straight across the wash up a dry streambed for about 500 feet and you'll come to the beginning of the trail. 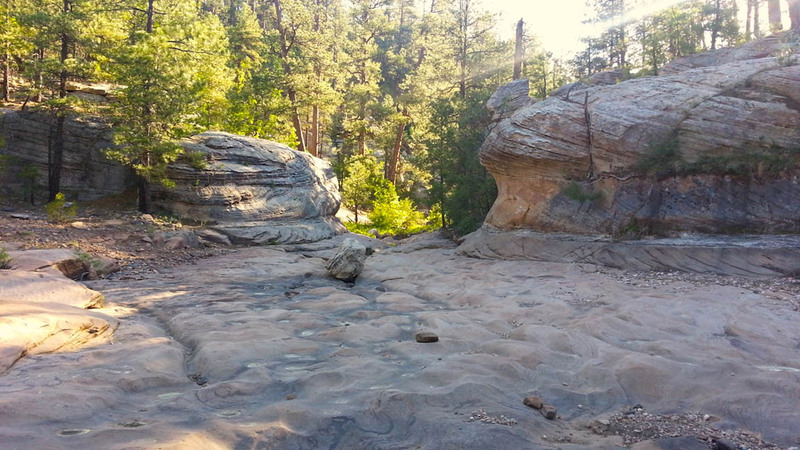 Description: This hike takes you through a pine forest near Flagstaff off of SR 89A (in Oak Creek Canyon). There are interesting rock formations as you travel along Kelly Canyon via Pumphouse Wash. After 1 mile, Kelly Canyon goes right (northeast) and is hard to follow. So we hike north on a well defined trail that follows a contributor wash Pumphouse Wash. The ambient temperature you encounter for this hike is cool because of the elevation (about 6400 feet) and the shade provided by the trees. The trail intersects FR 237 after about 2 3/4 miles. We found snow on our hike late in April 2009. The early morning summer temperatures are in the 50's and low 60's making this a wonderful summer hike. There were a number of wildflowers along the trail. Here's a link to a video from our July 2011 hike (http://youtu.be/Pxhdl3-5Jes).